Video objects can be animated just like any other graphical object in the Studio editor. In other words, you can apply all standard animation effects on these video objects, such as Fade in/out, Hand shift/drag, Move & Zoom... You can upload videos in most typical file formats, such as MP4, MOV, WMV, etc. It is not yet possible to upload a GIF to the Personal Library. When this feature is available, this article will be updated. 2. Storyblocks: You can also choose a video from the more than 100,000 royalty free stock videos available in the Storyblocks library! This library contains stock footage on many different topics, as well as beautiful motion graphics backgrounds. 3. 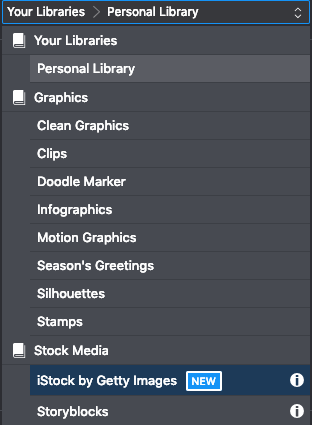 Getty Images: You can find the Getty Images library in Moovly Studio by selecting ‘iStock Getty Images’ from the drop-down menu on the top left side of the Studio editor. Next, enter your search term in the search field and open the Filter drop-down list to select the type of media you are looking for. When you have found the object you would like to use in the Getty Images library, just click the “Insert in Moov” button (bottom right). Once you have purchased these objects, the Getty Images watermark will be removed and you'll be free to use them in any other Moovs. Click 'OK' and then you will see the object on the Stage. Click play, and you can watch the video. You can extend these video loops and make them as long as you need. If I purchase Getty Images objects in one Moov, can I use them in other Moovs without paying extra?